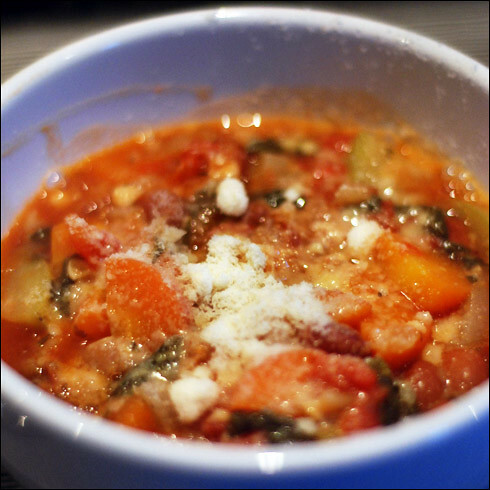 Ribollita simply means "reboiled" in Italian, and true to form, this soup tastes even better on its second heating. As the days grow gradually cooler, I had a craving for a hearty soup and this hit the spot perfectly. Visiting my aunt in Tuscany, I have had many variations on this and the one constant is the simple ingredients and hearty, wholesome nature of the soup. If you wish to make this dish vegan, simply omit the parmesan and make sure you use vegetable rather than chicken stock. With soup this delicious, who needs meat anyway? Put the barley in a pan with about an inch of cold water in it and bring to the boil, then drain, rinse and repeat. Once cooked, set the barley aside in a colander or sieve until ready to use. Chop the onions and slice the carrots and fry in olive oil over a low heat for five minutes. While these are frying, dice the courgette and add to the pan. Fry for 5 minutes then add the garlic, mixed herbs and chilli flakes and fry for a further minute. Add the chopped tomatoes, tomato purée, and stock. Season to taste with salt and pepper. Drain then mash half the beans with a fork and add to the pan along with the barley then gently bring the soup to the boil. Lower the heat and simmer for 30 minutes. After 30 minutes, add the remaining beans and shredded spinach to the pan. Simmer for a further 30 minutes. When nearly ready to serve, stir 1 tbsp of grated parmesan into the soup, toast the bread until golden and place 2 pieces in each soup bowl then drizzle with a little olive oil. To serve, spoon the soup over the ciabatta into the bowls and top with a sprinkling of Parmesan.